Still the same 1st Grade stone but this floor is Jura Limestone is characterised by the cross over and mixed colour. Totally unique and very good value limestone. Limited offer. At the quarry the are a limited number of blocks which are quarried where the blue grey tone crosses over to beige. By selecting out these blocks and cutting tiles from them a unique floor or wall tile is created. This is first quality Jura Limestone, and highly regarded for the shells and fossils which are present in the stone. 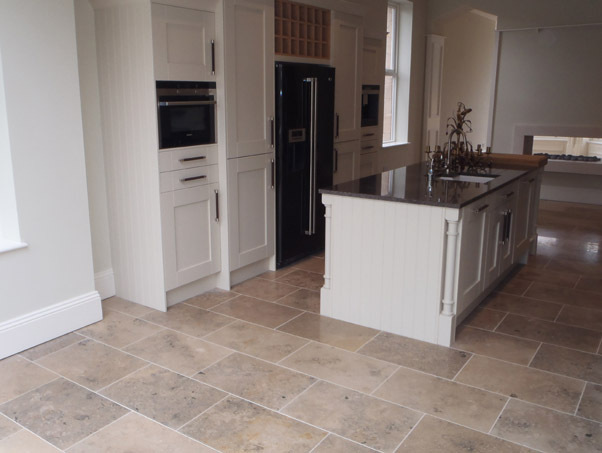 This particular limestone is right of the top of the scale for durability and is therefore a very good choice for either high traffic areas in a property, or in a bathroom where the character is desired, rather using a much plainer consistent coloured stone. Please feel free to call or email with any queries at all, we are happy to help and advise wherever possible.